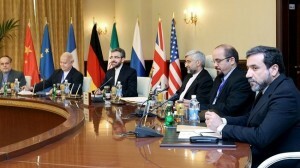 Secretary of Iran's Supreme National Security Council (SNSC) Saeed Jalili (third R) was heading the Iranian negotiating delegation in the talks with the P5+1 in Baghdad. …the Agency is unable to provide credible assurance about the absence of undeclared nuclear material and activities in Iran, and therefore to conclude that all nuclear material in Iran is in peaceful activities. We have listened to the wisdom in an old Russian maxim. And I’m sure you’re familiar with it, Mr. General Secretary, though my pronunciation may give you difficulty. The maxim is: Dovorey no provorey — trust, but verify. 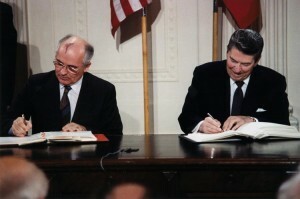 President Reagan made the phrase, “trust, but verify” practically synonymous with US-Soviet arms control. It’s also a phrase that has been adopted by the International Atomic Energy Agency (IAEA), which advertises itself as having “a proven track record of remaining true to the principle ‘trust but verify.’” “Trust, but verify” captures a certain common sense notion of the tension between exhibiting faith in someone else’s intentions, and the desire to make sure that your judgment is correct by checking to see that their deeds match their words. However, after spending this past week learning about international nuclear safeguards policy, I came to the conclusion that “trust and verify” would be a more principled basis on which to build confidence in nonproliferation. The course, International Nuclear Safeguards Policy, was co-hosted by the Center for Nonproliferation Studies and Lawrence Livermore National Laboratory. In it experts from the IAEA and national labs covered the history and legal foundations of safeguards, and the technical aspects of the process through which IAEA inspectors verify that the material facts on the ground match the declaration of activities provided by officials of the country under inspection. Historically, the primary responsibility of IAEA inspectors has been to build confidence in the Nonproliferation Treaty (NPT) by accounting for declared nuclear material as it moves through the nuclear fuel cycle, and certifying that the declaration is correct. Through this process IAEA can provide de facto assurance that the country in question is not diverting any of the declared material from energy production to nuclear weapons programs. Known as Comprehensive Safeguards, these agreements are technically challenging to verify, but fairly straightforward. What Comprehensive Safeguards do not—and cannot—do is certify beyond a doubt that there are no clandestine activities being carried out simultaneously. In other words, they cannot verify that a declaration is complete. So, if you think the point of safeguards is to prevent cheating, they will always fall short of expectations—as they did most recently with the revelation of Iran’s covert nuclear enrichment program, and most significantly in the case of Iraq’s illicit weapon program during the 1980s and early 90s. In both cases, the countries in question did not divert material from their declared nuclear activities, but rather created a parallel, clandestine program for enriching uranium from other sources. Advocates of the Additional Protocol believe that it strengthens the IAEA, but there is another side to this story. Comprehensive Safeguards, as originally designed, essentially amount to an audit. They simply verify that a state’s declaration is an accurate description of the activities it contains, and states are presumed to be in compliance unless there is information to indicate otherwise. Audits create a sense of accountability, but they also give the state in question a mechanism with which to credibly demonstrate its own mastery of the nuclear fuel cycle. In this sense they are mutually beneficial. Under the Additional Protocol, in contrast, inspectors have gone from being auditors, to being detectives. The IAEA’s expanded authority means that inspectors can now seek access to undeclared facilities, including access based on third-party evidence. States under inspection have gone from being presumed innocent until proven guilty, to being assumed guilty until proven innocent. This places both the IAEA and the states under inspection in an untenable position. In the long-term the Additional Protocol will undermine the credibility of the system. The problem is that the impartiality of the IAEA depends upon a scientifically rational process, yet the Additional Protocol does not respect the limits of that process. In setting out to “provide assurance as to the absence of undeclared nuclear materials” the IAEA is setting itself up to fail. Proving a non-event stumbles on an irresolvable epistemological problem because we can never know for sure that there isn’t something else the IAEA overlooked. As a result, it asks too much of the inspectors. Under the auditing function an inspector performs for traditional Comprehensive Safeguards agreements, she or he could say with certainty, “I can verify that under the bounded conditions of the declaration, the facts on the ground match the statement at hand.” Anything above and beyond that is left up to others to interpret. However, under the Additional Protocol, in the final instance, any honest inspector will be force to say, “All we can tell you is what we have found, anything else we cannot know for sure.” If they have not found any evidence of an illicit nuclear program, yet suspicions abound, this conclusion will always be unsatisfactory because it cannot help us distinguish between violators and non-violators. Yet, a stronger statement in either direction will inevitably appear politically motivated. For the sake of argument, let’s say Iran admits IAEA inspectors to Parchin and they find nothing, what would that prove? What kind of evidence would be sufficient to assure the IAEA and P5+1 that Iran does not have a clandestine nuclear program? How can you trust in a finding that by its very nature cannot be verified? In the case of Iraq, the US wasn’t satisfied until post-invasion inspections laid bare the entire country. If we continue down the same road, we are likely to end up with a similar outcome in Iran. This is an alternative for which the US government should be prepared. However, it is a less than desirable outcome for all parties involved. If instead of basing safeguards policy on the principle of “trust, but verify,” we predicate it on the twin pillars of trust and verification, it changes the approach and, hopefully, the outcome. “Trust, but verify” poses trust and verification as alternatives to one another. That’s why Reagan liked the saying. It’s a funny way of saying you trust someone, while at the same time acknowledging that you don’t. “Trust and verify,” on the other hand, poses trust and verification as two complementary pillars, both of which are necessary for the functioning of effective safeguards. It also acknowledges the limitations of each pillar on its own. The Additional Protocol has shifted the focus of safeguards policy from the more balanced approach of Comprehensive Safeguards, to an over-emphasis on verification. The principle of “trust and verify” would move the balance back toward a bounded approach to verification activities and an acknowledgement that IAEA inspections should be only one means of assessing the trustworthiness of nations and building confidence in the Nonproliferation Regime. “Trust and verify” should also be the approach that the P5+1 brings to its round of talks with Iran scheduled for June 18-19 in Moscow. Both pillars will be necessary in order to stabilize the security dilemma in which all parties now find themselves. For Iran, this will mean agreeing to confidence building measures such as additional inspections. Bolstering verification is necessary to compensate for the trust deficit Iran created by carrying out clandestine enrichment activities of questionable legality. However, Iran also has to be able to trust that there is an alternative to US invasion other than through the self-reliance offered by a domestic nuclear arsenal. Focusing exclusively on sanctions as a coercive mechanism is a good way to get Iran to the table, but creating credible security assurance will be the only way to close the deal.